This composite image shows a sliver of Pluto's large moon, Charon, and all four of Pluto's small moons, as resolved by the Long Range Reconnaissance Imager (LORRI) on the New Horizons spacecraft. All the moons are displayed with a common intensity stretch and spatial scale (see scale bar). Charon is by far the largest of Pluto's moons, with a diameter of 751 miles (1,212 kilometers). Nix and Hydra have comparable sizes, approximately 25 miles (40 kilometers) across in their longest dimension above. Kerberos and Styx are much smaller and have comparable sizes, roughly 6-7 miles (10-12 kilometers) across in their longest dimension. 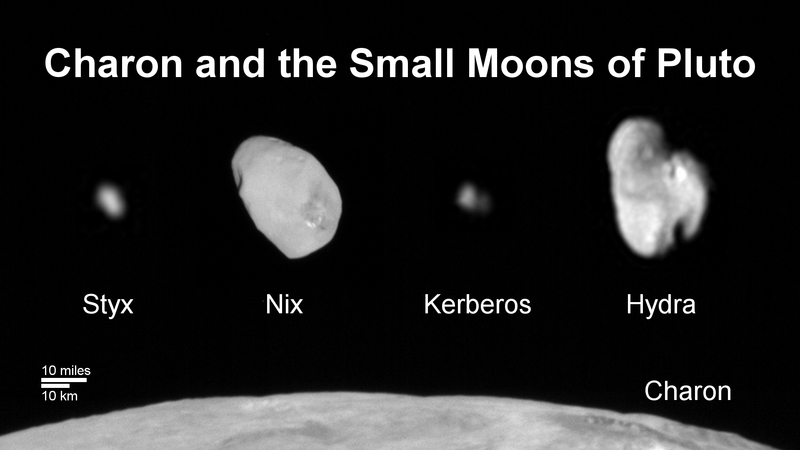 All four small moons have highly elongated shapes, a characteristic thought to be typical of small bodies in the Kuiper Belt.